About Little Tikes Founded in 1970, the Little Tikes Company is a multi-national manufacturer and marketer of high-quality, innovative children's products. They manufacture a wide variety of product categories for young children, including infant toys, popular sports, play trucks, ride-on toys, sandboxes, activity gyms and climbers, slides, pre-school development, role-play toys, creative arts, and juvenile furniture. Their products are known for providing durable, imaginative, and active fun. In November of 2006, Little Tikes became a part of MGA Entertainment. MGA Entertainment is a leader in the revolution of family entertainment. Little Tikes services the United States from its headquarters and manufacturing facility in Hudson, Ohio, but also operates several manufacturing and distribution centers in Europe and Asia. 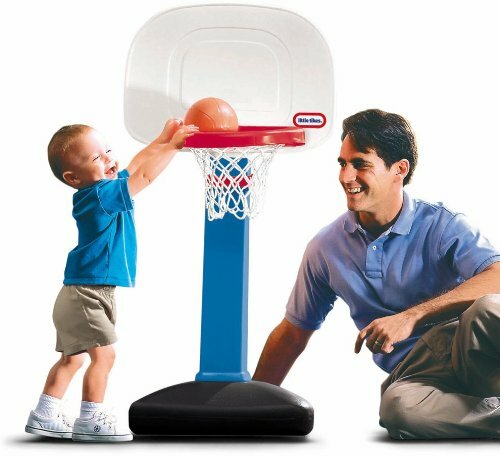 Basketball set makes sports easy for growing toddlers. 6 height adjustments from 2.5-4 ft. tall. Base can be weighted with sand for stability. Includes an oversize rim and a kid-sized basketball. Dimensions: 22L x 23.75W x 61H in..